Una brillante economista di origine italiana, attuale radicamento britannico, esperienza internazionale. Wikipedia in italiano, come sempre in ritardo nel confezionare le biografie delle personalità effettivamente più rilevanti del nostro tempo e delle epoche passate, ancora non le ha dedicato una biografia ragionata. Ci ha pensato Wikipedia in lingua inglese, di molti eoni più avanti della sua sorella italica pasticciona (gli errori e gli orrori si sprecano, tra le pagine wikipediane curate da collaboratori peninsulari), censoria, omissiva, superficiale e asservita a interessi spesso meschini e inconfessabili. Mariana Mazzucato (born June 16, 1968) is an economist. She is RM Phillips Professor of Science and Technology at the University of Sussex (SPRU). Mazzucato spent most of her life in the United States before returning to Europe in 2000. 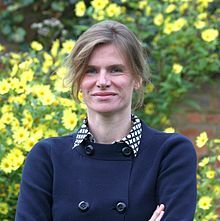 Mazzucato obtained a Bachelor of Arts in history and economics from Tufts University in 1990, a Masters in economics from the New School for Social Research in 1994, and a PhD in economics, also from the New School in 1997. After receiving her PhD, she became assistant professor of economics at the University of Denver in 1997. She was the Coordinator of a 3 year European Commission Framework Programmes 7 project on finance, innovation and growth (FINNOV, 2009–2012) and Economics Director of the ESRC Centre for Social and Economic Research on Innovation in Genomics (Innogen). She was Deputy Director of the Open University's inter-faculty centre on Innovation, Knowledge and Development, which she directed from 2004–2009. From 2007–2009 she was visiting professor at Bocconi University. She is also a research associate of the UK based think tank DEMOS and has published a number of research papers for the international think tank Policy Network. Mazzucato's research uses theoretical, empirical, and computational techniques in economics to study the feedback between technological change, firm performance and industry structure. She works within the Schumpeterian framework of evolutionary economics, studying the origin and evolution of persistent differences between firms and how these differences vary across sectors and over the industry life-cycle. Her empirical studies have focused on the auto, PC, biotech and pharma industries. Her most recent work has analyzed the co-evolution of technological change and stock market bubbles. In this, she claims that stock price volatility tends to be highest at the firm and industry level, when technological innovation is the most "radical". In 2011 Mazzucato published a book for DEMOS, The Entrepreneurial State, in which she argues that the most risky and uncertain investments underlying most technological revolutions were undertaken by public sector agencies. She claims that neither the 'market failure' perspective nor the National Systems of Innovation perspective, have adequately studied the risk-taking role of the public sector, and its ability to set the vision and 'mission' for private sector growth. She also argues that while private risk finance is lacking in many sectors, most venture capital investments in Silicon Valley were riding the wave of public sector investments. Developing this argument, in a 2012 paper for the think tank Policy Network entitled The Risk-Reward Nexus, Mazzucato argues that central to this policy debate is an understanding of the tension between how value is created and how value is extracted in modern day capitalism. Offering a new perspective on why 'smart' innovation-led growth has not led to 'inclusive growth', she argues that there is a disproportionate balance between the 'collective' distribution of risk taking in the innovation process, and the increasingly narrow distribution of the rewards. Similarly, she argues in another paper for the think tank Policy Network called Rebalancing What?, Mazzucato argues that the problem is not only one of short-termism, it is also about the way in which financial activities focused on value extraction have been rewarded above activities focused on value creation – often leading to value destruction. Mazzucato, M. (2011), The Entrepreneurial State, Demos, London, UK. ISBN 978-1-906693-73-2, 149 pages. Mazzucato, M., Lowe, J., Shipman, A. and Trigg, A. (2010), Personal Investment: Financial Planning in an Uncertain World, Palgrave Macmillan, Basingstoke UK, ISBN 978-0-230-24660-7, 448 pages. Mazzucato, M. and Dosi, G. (Eds, 2006), Knowledge Accumulation and Industry Evolution: Pharma-Biotech, Cambridge University Press, Cambridge UK, ISBN 0-521-85822-4, 446 pages. 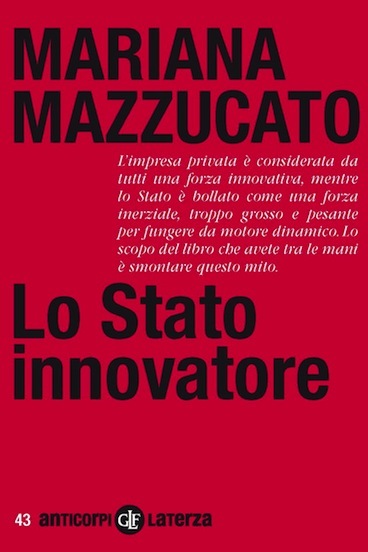 Mazzucato, M. (Ed, 2002), Strategy for Business, A Reader, Sage Publications, London, 2002, ISBN 0-7619-7413-X, 378 pages. Mazzucato, M. (2000), Firm Size, Innovation and Market Structure: The Evolution of Market Concentration and Instability, Edward Elgar, Northampton, MA, ISBN 1-84064-346-3, 138 pages. Mazzucato, M. and Tancioni, M. (2012), “R&D, Patents and Stock Return Volatility,”Journal of Evolutionary Economics, Vol. 22 (4):811–832. Demirel, P. and Mazzucato, M. (2012), “Innovation and Firm Growth: Is R&D Worth It?”Industry and Innovation, Vol. 19, (2). Demirel, P. and Mazzucato, M. (2010), "The Evolution of Firm Growth Dynamics in the US Pharmaceutical Industry", Regional Studies, Vol. 44 (8), pp. 1053–1066. Mazzucato, M. and Tancioni, M. (2008), "Idiosyncratic Risk and Innovation: A Firm and Industry Level Analysis", Industrial and Corporate Change, Vol. 17 (4), pp. 779–811. Mazzucato, M (2006), "Innovation and Stock Prices", Revue de L’Observatoire Francais de Conjonctures Economiques", June 2006, Special Issue on Industrial Dynamics, Productivity and Growth. Mazzucato, M. and Tancioni, M. (2005), "Indices that Capture Creative Destruction: Questions and Implications", Revue d’Economie Industrielle. 110 (2nd tr. ), pp. 199–218. Mazzucato, M. (2003), "Risk, Variety and Volatility: Innovation, Growth and Stock Prices in Old and New Industries", Journal of Evolutionary Economics, Vol. 13 (5), pp. 491–512. Geroski, P. and Mazzucato, M. (2002), "Learning and the Sources of Corporate Growth", Industrial and Corporate Change, Vol. 11 (4), pp. 623–644. Mazzucato, M. (2002), "The PC Industry: New Economy or Early Life-Cycle", Review of Economic Dynamics, Vol. 5 (2), pp. 318–345. Geroski, P. and Mazzucato, M. (2002), "Myopic Selection and the Learning Curve", Metroeconomica, Vol. 53 (2), pp. 181–199. Mazzucato, M. and Semmler, W. (2002), "The Determinants of Stock Price Volatility: An Industry Study", Nonlinear Dynamics, Psychology, and Life Sciences, Vol. 6 (2), pp. 230–253. Geroski, P. and Mazzucato, M. (2002), "Modelling the Dynamics of Industry Populations", International Journal of Industrial Organization, Vol. 19 (7), pp. 1003–1022. Mazzucato, M. (2000), "Firm Size, Innovation, and Market Share Instability: the Role of Negative Feedback and Idiosyncratic Events", Advances in Complex Systems, Vol. 3 (1–4), pp. 417–431. Mazzucato, M. and Semmler, W. (1999), "Stock Market Volatility and Market Share Instability during the US Automobile Industry Life-Cycle", Journal of Evolutionary Economics, Vol. 9 (1), pp. 67–96. Mazzucato, M. (1998), "A Computational Model of Economies of Scale and Market Share Instability", Structural Change and Economic Dynamics, Vol. 9 (1), pp. 55–83. Invitiamo soprattutto l’opinione pubblica a guadagnare consuetudine con un saggio davvero notevole e controcorrente (rispetto al paradigma attualmente egemone in Occidente, e cioè quello neoclassico, neoliberista e anti-keynesiano) della Mazzucato, e cioè The Entrepreneurial State, pubblicato per la prima volta a Londra, per le edizioni Demos, nel 2011. Un libro che dovrebbe essere tradotto letteralmente in italiano così: Lo Stato imprenditoriale, ma che invece le Edizioni Laterza hanno denominato, pubblicandolo nel 2014: Lo Stato innovatore. L’impresa privata è considerata da tutti una forza innovativa, mentre lo Stato è bollato come una forza inerziale, troppo grosso e pesante per fungere da motore dinamico. Lo scopo del libro che avete tra le mani è smontare questo mito. Chi è l’imprenditore più audace, l’innovatore più prolifico? Chi finanzia la ricerca che produce le tecnologie più rivoluzionarie? Qual è il motore dinamico di settori come la green economy, le telecomunicazioni, le nanotecnologie, la farmaceutica? Lo Stato. È lo Stato, nelle economie più avanzate, a farsi carico del rischio d’investimento iniziale all’origine delle nuove tecnologie. È lo Stato, attraverso fondi decentralizzati, a finanziare ampiamente lo sviluppo di nuovi prodotti fino alla commercializzazione. E ancora: è lo Stato il creatore di tecnologie rivoluzionarie come quelle che rendono l’iPhone così ‘smart’: internet, touch screen e gps. Ed è lo Stato a giocare il ruolo più importante nel finanziare la rivoluzione verde delle energie alternative. Ma se lo Stato è il maggior innovatore, perché allora tutti i profitti provenienti da un rischio collettivo finiscono ai privati? Di certo, alcuni di noi di DRP si permettono di suggerire ai massimi promotori del Movimento Roosevelt (evoluzione più aggiornata del progetto per l’Associazione “Eleanor Roosevelt per il Socialismo Liberal”, che troverà la sua costituzione ufficiale nel corso del mese di gennaio 2015), di coinvolgere in qualche modo, diretto o indiretto, la suddetta Mariana Mazzucato, nelle imminenti battaglie italiane ed europee per affermare un paradigma alternativo a quello attualmente vigente tanto nella Penisola che nel Vecchio continente. Un paradigma “innovatore” rispetto alla teologia dogmatica neoclassica e neoliberista ovunque imperante.